This blog takes a critical look at all of the available solutions to solve the upcoming TM1 SSL expiration issue. It also provides a way to find the best solution for your TM1 system, as well as methods to test the solution was successful. The options you have are limited by your TM1 version. The infographic below shows the options by version. Users of Cognos Express: A fix for Cognos Express (which bundles with TM1) will also be made available. Depending on the version of Cognos Express, a manual approach (which will be documented) may be required. To continue using TM1Top you must add the admin server ssl ca to the tm1top.ini configuration file. For example: adminsvrsslcertauthority=C:\Program Files\ibm\cognos\tm1_64\bin\ssl\tm1ca_v2.pem. (Do not put the path in quotes) You must also ensure that the TM1Top SSL folder is a copy of the TM1 Server SSL directory. If BI is connected to TM1 the TM1 certificate information needs to be updated on the BI server. You can find details in this tech note. 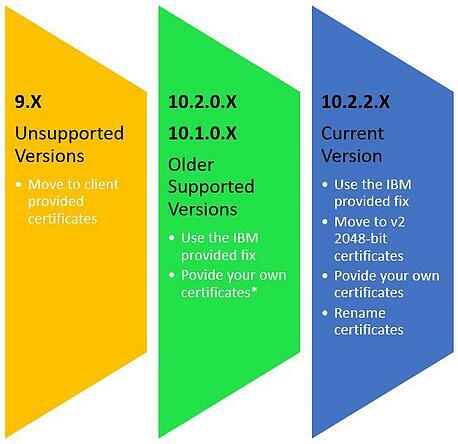 http://www-01.ibm.com/support/docview.wss?uid=swg21644290. The solution requires access to copy files from TM1 server to the BI server, as well as file edit permissions on the BI server. You can find the web.config file in the root directory of your WebWORQ site. A sample one is located in the WebWORQ install directory ( \Program Files\QueBIT\FrameWORQ\WebWORQ\Web). Open the file in the text editor of your choice, I prefer notepad++ but notepad works as well. Remove the XML comment tags, “<!—“ and “-->”, around the “add key” portion so it looks like this. Update the file paths to point to the new certificates. Save the changes to the web.config file, this will trigger a restart of IIS. You can now test WebWORQ to make sure it can connect to TM1. With so many different options it is important to understand which one fits your system best. We invite you visit our TM1 SSL Decision Assistance website. Once the fixes are in place there are few ways to test if the changes were successful. Turn your system clock forward past the expiration date (11/24/2016). Only do this on a non-production system. Please be aware of governance and compliance rules regarding tests like this.